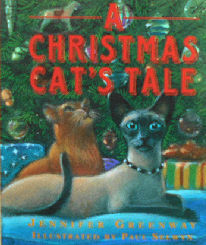 In this little mini book (3 1/4" wide x 3 3/4" high), Seraphina the Siamese cat discovers that she is loved by her family and her friend Chester the tabby cat next door. Copyright 1994, 79 pages. Color illustrations on each page. Previously owned but in good condition.